Here at Woodford Waste Removal, our dependable, fully licensed team provides a comprehensive service to satisfy all your waste removal needs. Whatever you require, be it house clearance, garden clearance, office clearance, builders waste removal, commercial waste removal or skip hire, rest assured we have the solution. Whether you’ve got some bulky junk to shift, or you’re just looking to declutter your Woodford home or business, don’t hesitate to get in touch. Not only are we fully licensed, our fast and friendly team offers an affordable same-day waste removal service, that can be tailored for your specific needs. 80% of the waste we collect is either reused or recycled, so you can have complete peace of mind in the knowledge your waste is being properly disposed of. 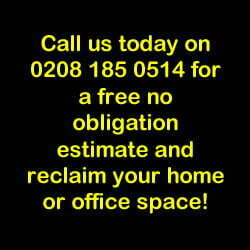 We know you have better things to do with your time than spend hours traipsing to and from your local dump, so don’t hesitate to give us a call on 0208 185 0514 or contact us online, sit back and let us do the hard work for you. Call us on 0208 185 0514 or book online – we book in two-hour slots to ensure we come at a time that suits you. An hour before we arrive, we’ll give you a ring with a no obligation estimate. Remember, as we only charge you for the space you take up, there are no hidden charges. We’ll arrive and take away all your unwanted junk and clutter, even sweeping up at the end to keep any unnecessary mess to a minimum! What can I say about Woodford Waste Removal? They arrived on time, worked incredibly hard, cleaned up after the job was done and nothing was too much trouble for them. I wish all waste removal companies were like them! Woodford Waste Removal have been handling our commercial waste removal for two years now and we could not be happier with the service. They are reliable, efficient and provide great value for money. Highly recommended!